Following the humorous speech given by Sen. Al Franken could have been difficult for a group of high-ranking algae executives chosen to update a room of nearly 1,000 people on the state of the industry, but it wasn't hard for these professionals. Secretary Tom Vilsack outlined USDA priorities for the 2012 Farm Bill during a speech at the John Deere Des Moines Works. Vilsack noted the U.S. has gone from importing 60 percent of its oil to 52 percent due to biofuels expansion. The African CleanTech Association launched Oct. 24 and the primary goal of the group is to assist in the development of African enterprises and technologies in the cleantech space while improving business sustainability and socioeconomic development. The St. Anthony Falls Laboratory in downtown Minneapolis originally formed to study hydroelectric energy, but today the research team at St. Anthony is working on projects that range from wind energy to the swimming patterns of algae. A U.S. record 119 million gallons of biomass-based diesel were sold during the month of September, the EPA reported Monday, marking the sixth consecutive monthly record and representing an 8 percent increase over August's high of 110 million gallons. The 2012 advanced biofuel pool of 2 billion gallons in RFS2 is an opportunity to grow biodiesel beyond the 1 billion gallon biomass-based diesel volume required under the program, but 107 Brazilian cane ethanol producers are registered with U.S. EPA. Starting Oct. 24, New York City buses and the subway system will be covered with Bioheat ads. Radio commercials are already airing on six highly rated CBS stations. One spot says, "Choose the cleaner, renewable home heat without changing equipment." 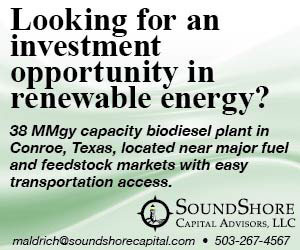 "Maverick marketers," as Michael Cooper with UGES called them, are already in some places taking advantage of the swaying price of biodiesel and their ability to blend more or less into their heating oil, depending on the time of the year. The Woodlands, Texas-based glycerin marketing and refining company BenchMark Energy Corp. has signed an agreement to acquire a 49 percent stake in Indiana-based Energy Partners LLC, with a contingent option to acquire the remaining 51 percent. Houston-based Accelergy Corp. will provide the Yankuang Group with its trademarked TerraSync terrestrial sequestration system to capture carbon dioxide from the future coal-to-liquid facility in Erdos, an area in China's Inner Mongolia Province.